Had so much fun playing this game last night with the kids. 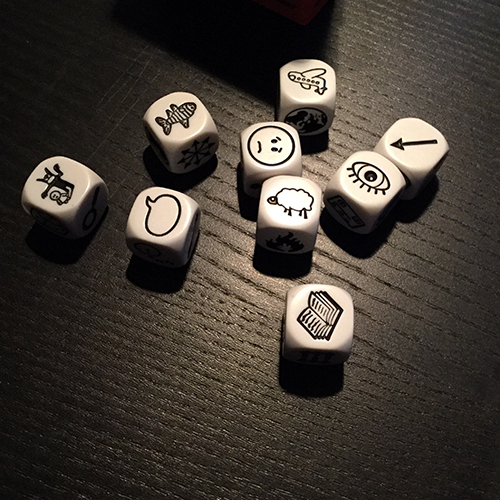 Rory’s Story Cubes is pretty straight forward. Basically everyone gets a few dice and someone starts telling a tale. Then throws a die and has to incorporate that object into the story and the tale gets handed off to the next person and on and on it goes. I guess it’s not a game in the traditional sense of someone winning, but we killed a solid hour going around and around the table. I can promise you one thing – you learn a LOT about your children when they have to riff on a picture of a frowny face coupled with an envelope and super counter ball thingy (an abacus to those out of the 2nd grade). The songs, books, commercials, friends names, etc. that occupy your kids’ brains all bubble to the top and spill out. So much fun. This is a certainly gift for readers of all ages. And looking at their site, they now have a Batman branded edition as well as others that focus on ‘actions’, ‘voyages’, etc. 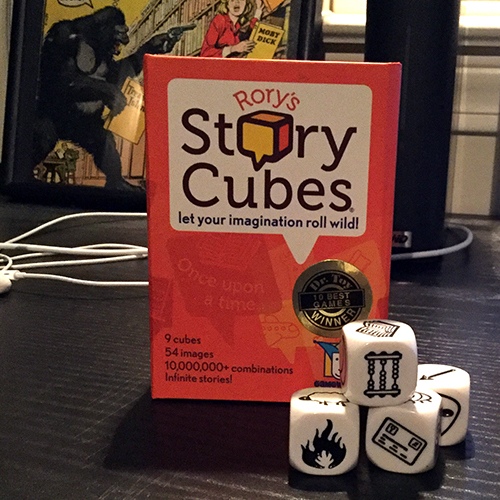 Anyway, check out Rory’s Story Cubes if you know of anyone learning to write or that loves stories. 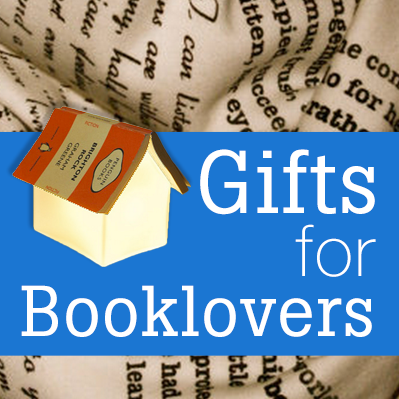 This week’s Gifts for Book Lovers is all about the words on the wall. 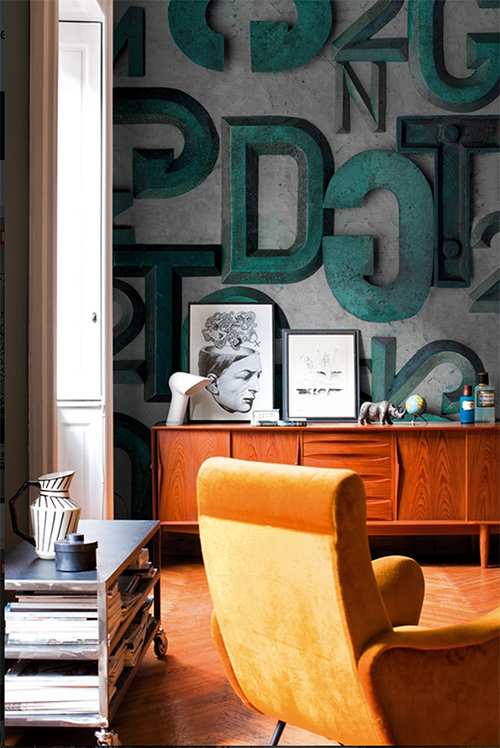 Check out these new typographic wallpaper from the fancy folks at Wall & Deco. This first one is called Wordless. It’s sort of a washed out bled through bad-photocopy-paper effect and I like it. It’s just enough that the wallpaper says “book” but your guests won’t spend all evening looking over your shoulder reading. It looks like a bad Google Books scan or something. But if you’re more of a bold font sort of person, check out this typographic wallpaper called Bronzo. It has that old world metal letter vintage signage vibe. The colors would pop too. You’d need the right room for this though. This last one is called Covers and is the most subtle of the bunch. 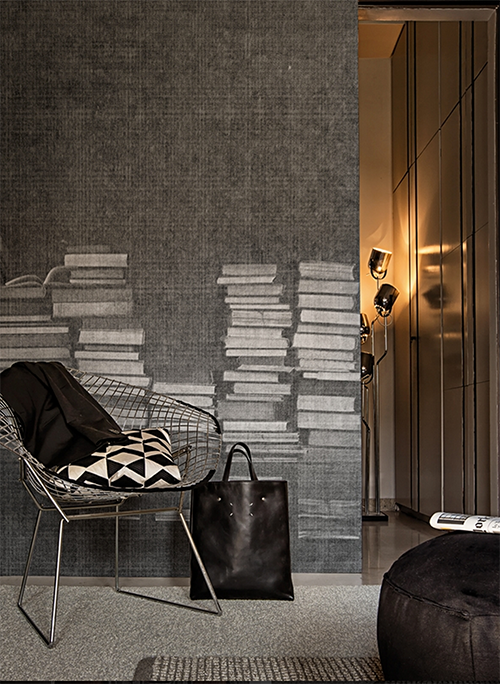 It’s not really a typographic wallpaper, but hey, it’s stacked books! This one would work in just about any room I would think though it’s kind of hard to tell what that linen pattern is doing. I couldn’t find any pricing for these wallpapers, but I’m sure if you created a Wall & Deco account or shot them an email they’d be happy to chat with you. 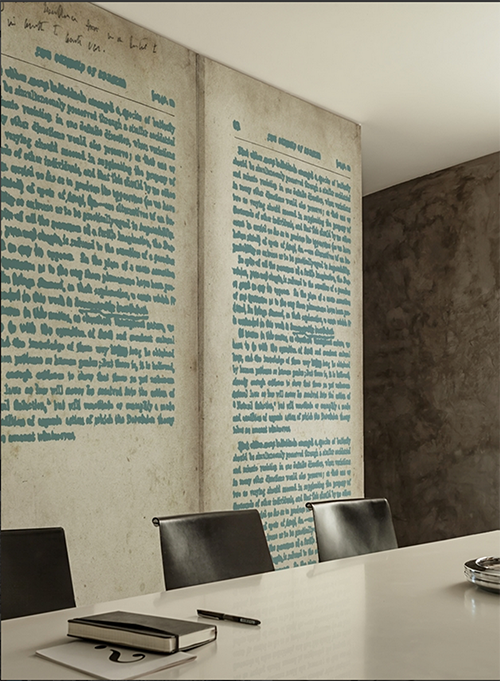 These wallpapers would be a great gift for any book lover’s home. This weekend is the Great American Backyard Campout, where people pop-up their tents in their yards to celebrate camping, community and nature. Every book lover reading this just thought, “If I did that – what book would I bring to read”?. 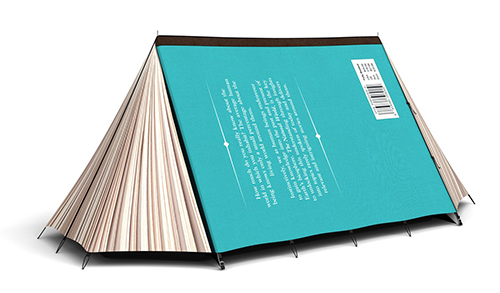 So in honor of this weekend, I would like to share with the Fully Booked book tent! It’s a tent. . . that looks like an open book. And unlike your paperback this book is 100% waterproof. The site says it sleeps 2-3 people. I am thinking that’s really 2 people with no room to move or prop up and read. But hey, this book tent is about as cool and campy as it gets. What book lover wouldn’t want this as a gift to take out in the backyard and spend the night under the stars? 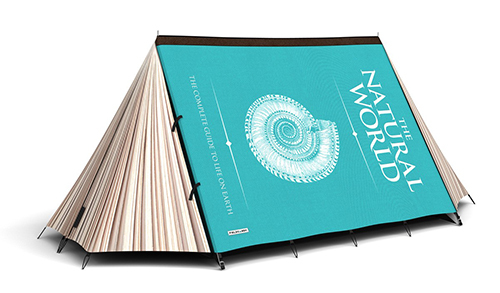 This book tent costs $445.00. Its oversized book cover sports a blurb on the back and even a barcode. I think the flaps that are designed to look like pages of an open book are too fun. Hope you make it outside this weekend with a good book! This case retails for $99 and you can buy it from the 12 South site. 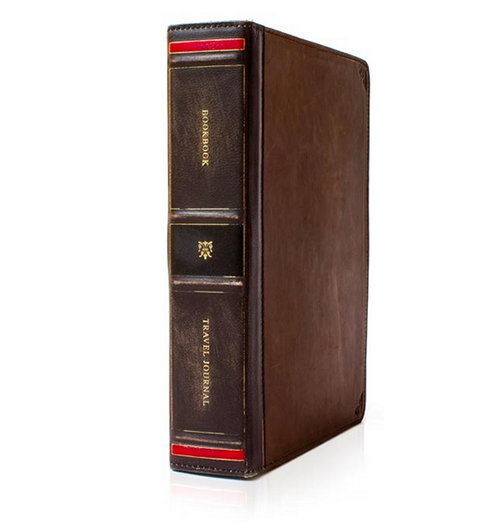 The cover is pretty darn swanky looking and just like any good leather bound book, you can really only start to appreciate the whole story once you’ve opened it. 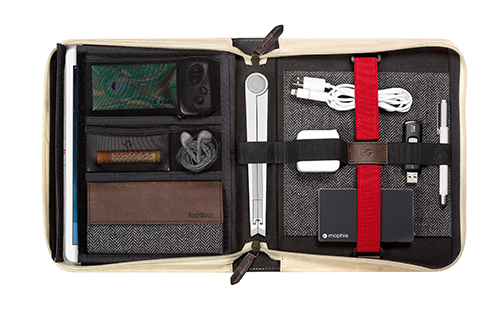 Lots of pockets, sleeves, bands, cable holders, slots, zippers, pouches and organization going on it here. I have no idea what that object is going down the spine on the inside. Maybe a tripod of some kind? But it’s a missed opportunity if it’s not an easel for propping up a book (or an iPad, I guess, if you have to). And according to the specs it will house any iPad or iPad mini. I’ve yet to get to a place in life where I tote the iPad around outside of work. 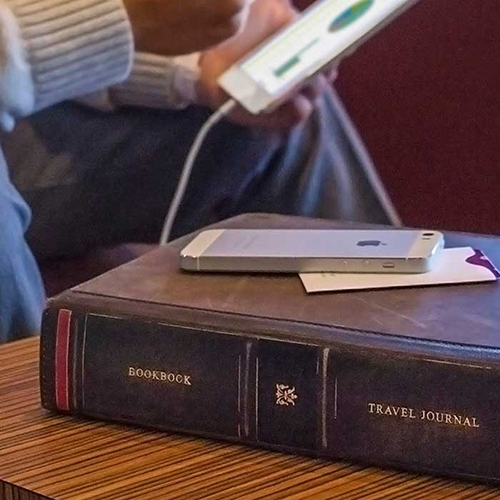 But this iPad case kind of makes me want to.